The Fiesta Van will be the smallest model in Ford's commercial vehicle lineup. Ford hopes advanced driver-assistance equipment, connectivity features and a sporty model will give its Fiesta car-derived van a sales boost in the segment for small commercial vehicles. 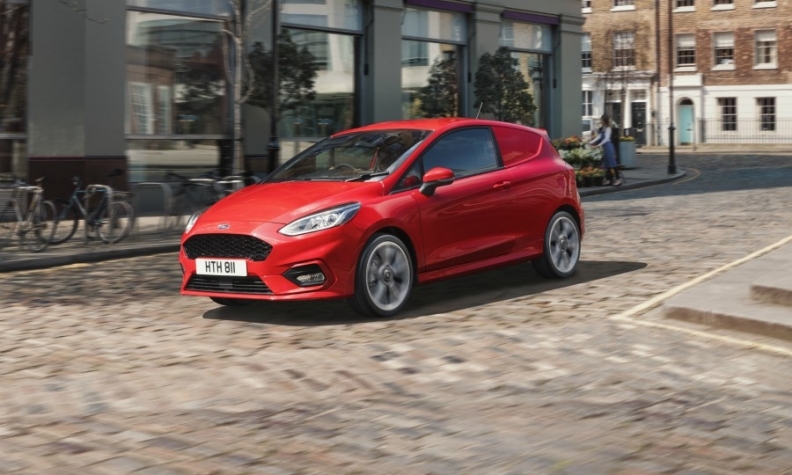 After launching the latest-generation of the Fiesta subcompact hatchback in Europe last year, Ford introduced the van version of its best-selling model in the region at the commercial vehicle exposition in Birmingham, England, on April 24. The Fiesta Van gets upgrades offered in the passenger version. It can be optioned with Ford’s SYNC 3 system, whichcomes with an eight-inch touch screen and allows access to smartphone apps through Apple CarPlay and Android Auto. Connectivity will be enhanced through FordPass Connect, a new onboard modem system that lets users connect up to 10 WiFi-enabled devices. The FordPass app includes a remote lock feature, vehiclediagnostics for maintenance intervals and fluid levels, and a locator system for parking lots. Optional driver-assistance features include an emergency braking system, adaptive cruise control, blind spot warning and active parking assistance.Offered in three-door configuration, the van will have a payload of about 500 kg, and cargo space will be one cubic meter. A full bulkhead separates cargo from driver and passenger. There will be a choice of 1.0- and 1.1-liter gasoline engines, with 85 hp or 125 hprespectively, and a 1.5-liter diesel engine with either 85 hp or 120 hp. Ford will also a offer a Sport model, with body-colored moldings, 18-inch wheels and upgraded interior trim. Orders for the Fiesta van will begin this spring, with deliveries starting in autumn. French brands lead the car-derived van segment to which the Fiesta van belongs (see chart below), according to JATO Dynamics, which tracks European vehicle registrations. Overall, 680,179 car-derived vans were sold in Europe in 2017, a 1.1 percent increase, JATO said. The chart lists cars that are sold for commercial use, whether their rear windows are covered with panels or not. In many cases, depending on country regulations, the rear seats are deleted to create a single cargo compartment separated from the driver and passenger.